Although independent Irish comic company Berserker has been publishing for less than two years and has but a small handful of titles to their name, they are producing some of the highest quality horror releases of today. With a talent pool that includes some of the top names in comics such as Alan Grant, Simon Bisley, and Glenn Fabry, this is one small company that has more than hit the ground running. I suspect that one reason these heavy-hitters from across the pond are telling their stories at Berserker is that they are just too explicit for most mainstream publishers. Case in point is the great title spotlighted here today: Church of Hell. Written by comics legend Alan Grant from a story by Andy Brown, and featuring art by Wayne Nichols, Simon Bisley, and Glen Fabry, Church of Hell is no-holds-barred horror comics at their uncompromising best. This is the current state of one Dominic Raggar (Dom for short), a once handsome young man whose appearance is the end result of some very, very, bad decisions. What began as a simple after work trip to the pub for a quick pint leads instead to a drug-fueled night in which he cheats on his girlfriend Cindy. The next morning his guilt is plainly obvious and he ignores his one chance to come clean, leading to both the accidental murder of Cindy’s brother and the beginning of his infernal downward spiral. Taking flight from the scene of the crime, Dom finds himself at the doors of a bizarre church he has not seen before. Upon entering, he is confronted by one of hell’s priests who gives the agonized and exhausted Dom a brief taste of what pain really means. As the brutal vision fades, the priest urges Dom to join him in the glories of hell. 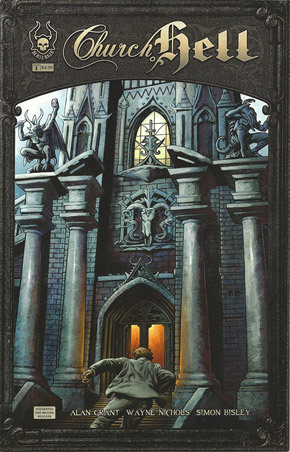 He argues that mankind will always give in to its darker urges and that humans, by their own nature, belong with Satan and his acolytes.As the horrified Dom runs from the church so begins a series of vicious scenarios in which he sees how horrible the remainder of his days may be if he seeks redemption for his crimes. However, these events are being created and manipulated by the priest as the possibility of eternal damnation becomes more of an only option for Dom. One particularly explicit sequence has Dom inadvertently causing a traffic accident which kills several people including two police officers and a mother and her infant with Satan himself presiding over the whole affair.Three issues have been released thus far of Church of Hell and writer Alan Grant foresees each story arc (concentrating on one character like Dom) covering 4 to 6 issues. As such we have not yet seen what exactly will happen to our protagonist in order to transform him into the malformed thing seen at the start of issue #1. Grant’s compact, no-filler writing makes Church of Hell charge forward at breakneck speed while the eye-popping (no pun intended) art keeps the reader glued to the page until the final panels are revealed. On the subject of the art, special note needs to be made of issue #3 as the entirety of the pencils and inks is by the incomparable Glenn Fabry. He is a familiar name to comic fans for the many sensational covers he has done including the entirety of the Preacher run. To see his talent devoted to a full issue of a comic (especially one like this) is a real treat. This is actually quite telling as to why such high-quality work more often than not sells in such low numbers, even with huge names like Bisley and Grant involved. It is understandable that readers want the next chapter of a favorite comic rolled out as soon as possible, but for work like the Berserker titles patience is a virtue that will definitely be rewarded. Church of Hell, as well as all the Berserker titles like The Dead: Kingdom of Flies and Maura Sterling all come very highly recommended for the horror fan, or any brave readers looking for quality comics that reside solidly outside the mainstream.